Like the face, the way your ear looks is a unique feature of your body. Although ears look similar, there are small differences in shape and structure of the pinna between different people. 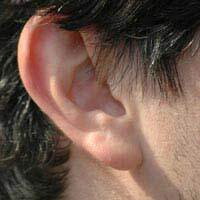 One of the features that is less variable is the shape of the earlobe; people can only have one of two types of earlobe. The first is an attached earlobe that is small, and has no free flap that hangs down. The second type is a free earlobe, which is larger and which does hang down, clearly separated from the neck. What is the Structure and Function of the Earlobe? The composition of the earlobe in humans is fairly simple’ it contains connective tissue, which is made up of a mixture of fat cells and areola tissue. It has quite a good blood supply and your earlobes can be prone to turning bright red if you go from a cold day outside to a very warm room, or even if you blush with embarrassment. There is no cartilage in the earlobe – so it is soft and squishy compared to the harder, more structure parts of the upper pinna. The function of the earlobe is something of a mystery. It doesn’t seem to do anything very much, except be a site for piercings and earrings. Losing your earlobe in an accident is rare, but it does not affect hearing or balance, its impact is really only cosmetic. Only one gene controls the shape of the earlobe. As with all genes, you have two copies, one from your father and one from your mother. Each copy is called an allele. The allele for a free earlobe is dominant over the allele for an attached earlobe, so most people do have free earlobes. If you have parents with free earlobes and you have an attached earlobe, you can be pretty confident that both of them had one copy of the dominant allele and one copy of the recessive allele. You were the result of a one in four chance – you inherited one recessive allele from both your parents. Although this is widely accepted, some other factors in the way that our ancestry has developed over thousands of years clearly plays some role because the proportion of attached earlobes in different racial groups varies. 67 per cent of people in Japan, for example, have an attached earlobe, with 64 per cent in China. Genetics also affects earlobe shape in children born with genetic diseases. These tend to be rare but a few have been recognised and described. In one, a larger earlobe for the size of the head is also often thickened and has a lumpy centre. This is associated with inherited speech disorders. In Wolf-Hirschhorn Syndrome, children are born without an end on their chromosome 4 and suffer a range of symptoms including poor growth, poor mental development, a misshapen skull and ear lobes of abnormal shapes and sizes. In Beckwith-Wiedemann Syndrome, all of the body organs are bigger than they should be, and carry on growing at an abnormally high rate, causing problems with all the major organ systems and in the abdomen. The face is usually also affected by deep red birthmarks and the earlobes usually have deep creases, sometimes even splits and fissures. These are by far the most common and, although they may not be too functional, they are a facial feature that adds to the overall appearance of our face and aids recognition and attraction in other people. Many people report that they enjoy their earlobes being touched and regard them as a minor erogenous zone. This is not surprising as the nerve supply as well as the blood supply is good in the earlobes. My 2 month old has one free earlobe and his other ear has a half attached earlobe why? Should I be concerned? Why is my earlobe thicker on one side? I have always been curious but have never been able to find out, can anyone tell me? Can attached earlobes be caused by the baby playing with it's ears in the womb,before the body is fully developed?